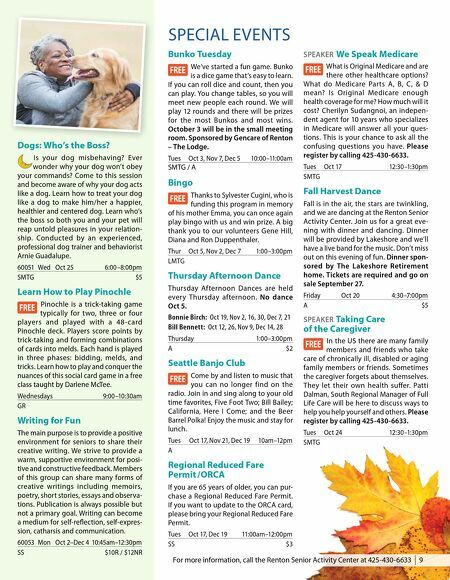 8 | Register for recreation programs online at rentonwa.gov/cybersignup Take time to meet the staff and learn about all the exciting programs and activities available. Join us in the lobby to begin your tour. Thank you to volunteer Jo Matas for conducting these tours. Fridays 10 –11am Lobby Oct 20, Nov 17, Dec 15 SPECIAL INTEREST AARP Driver Safety Program This eight-hour (four hours each day) classroom oriented (no driving) course covers state laws, driving conditions and safety. Course completion qualifies seniors for the state mandated insur- ance premium reduction. Payment is made by check or money order pay- able to AARP on the first day of class. Registration begins on the first working day of the month. Phone-in registration is accepted. No classes in November and December. Thursday Oct 19 & Oct 26 2:30–4:30pm LMTG $20 ($15 with AARP membership) Bible Study This non-denominational group is open to all individuals who wish to learn more about what the Bible teaches. No Class Nov 23. Thursdays 9:15–11:30am SMTG Donation Book Club Our book club is going strong and always welcoming more par- ticipants. We would love for you to join us. The schedule is as follows: The Moonstone, Wilkie Collins Wed Oct 18 10:00–11:30am Half Broke Horses: A True-Life Novel, Jeannette Walls Wed Nov 15 10:00–11:30am The Window Adventure, Charles Dickinson Wed Dec 20 10:00–11:30am SS Bridge Lessons For beginning and intermediate players that would like to learn the mystery of the game called bridge. This will be a hands-on learning (or reviewing) of the basic concepts of the game. Bidding (auction) will be explained as well as some of the card playing con- ventions. Instruction will be light and fun without any pressure to achieve goals. No class Nov 23. Thursdays 12:30–3:00pm SS ONGOING ACTIVITIES Beach Ball Volleyball Thursdays, 10–11am in the Large Meeting Room YOU'VE BEEN SERVED! Join in on the fun and laughter of beach ball volleyball while competing as a team. The game will be played while sitting in chairs. Closed Nov 23. Bocce Ball Equipment available daily Equipment is available during operating hours. Closed on Nov 10, 23, 24, Dec 25, 26. Cribbage Thursday mornings Meet for some fun games of cribbage. Closed Nov 23. Double-Deck Pinochle Mondays and Thursdays at 12:30pm Join the group and play double-deck pinochle. Closed Nov 23, Dec 25. Duplicate Bridge Tuesdays, 12:00pm in the Game Room There is a $1 charge. Hand and Foot Thursdays, 9–10:30am in the Game Room Keep the fun going all year long! Closed Nov 23. Handicraft Group Mondays, 9–11:00am in the Auditorium Learn from the experts in the group to knit, crochet, hand sew, etc. Bring your own projects and materials and join the group for great camaraderie and support of fellow handcrafters. Closed Dec 25. Mah Jongg Wednesdays, 12:00pm in the Game Room Learn the ancient Chinese tile game in this drop-in activity. If you have your own tiles, please bring them. Mexican Train Dominos Wednesdays, 9:30am in the Game Room Bring your friends! 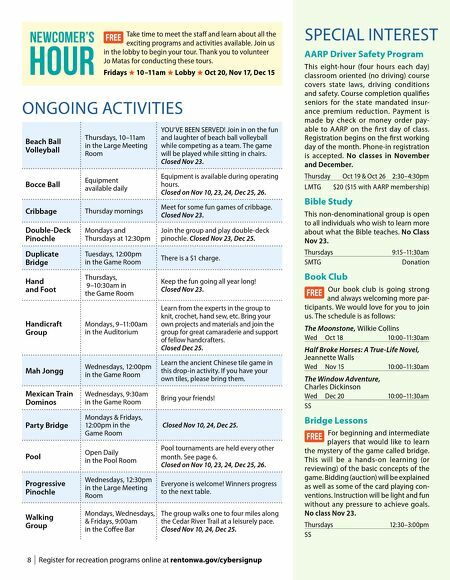 Party Bridge Mondays & Fridays, 12:00pm in the Game Room Closed Nov 10, 24, Dec 25. Pool Open Daily in the Pool Room Pool tournaments are held every other month. See page 6. Closed on Nov 10, 23, 24, Dec 25, 26. Progressive Pinochle Wednesdays, 12:30pm in the Large Meeting Room Everyone is welcome! Winners progress to the next table. Walking Group Mondays, Wednesdays, & Fridays, 9:00am in the Coffee Bar The group walks one to four miles along the Cedar River Trail at a leisurely pace. Closed Nov 10, 24, Dec 25.